Mental health conditions do not only affect adults, but they also affect thousands of children. Everyone has mental health and it is important that it is well looked after, just like it is important to look after your physical health. Good mental health and well-being in children allow them to develop resilience to help them cope with whatever life throws their way and pushes them to grow into well-rounded and healthy adults. For the first time since 2004, new research took place in regards to children and young people’s mental health in 2017. The 2004 data looked at 7,977 children and young people between the ages of 5-17 and found that 1 in 10 of them had some form of mental health condition. It also found that children and young people from lone parents or reconstituted families, or whose parents were unemployed or had no educational qualifications were more likely to be suffering. The new research in 2017 collected data from 9,117 children and young people and for the first time, extended their research to include preschool children ages 2-4 and young people ages 17-19. The 2004 data found 10% of children and young people had a mental health disorder. This had increased to 11.2% in 2017. It was revealed that boys are more likely to have a mental health disorder than girls up until the age of 11. Then between 11-16 years of age, both girls and boys are equally as likely to develop a mental health disorder. And between 17-19, girls were more likely to have a disorder – In this age range 1 in 4 girls had a mental health condition and half of them said that they have self-harmed and/or attempted suicide. 70% of children and young people who are struggling with their mental health have never received help for their disorders. There are also shockingly long waiting lists for mental health services with thousands of children having to wait over 3 months for their second form of contact with mental health professionals. This second form of contact can be done in various ways (over the phone, via a webcam chat or in person). One campaigner, Tom Madders, from YoungMinds Charity, said that many parents claim that the long waiting times have devastating effects on their children. Some parents said that their children self-harmed, became suicidal or dropped out of school as a result of the long wait. Children and young people’s mental health services in Manchester have recognised that this waiting time is not acceptable and are trying to bring their waiting times down to a 4-week period – Some may say that this is still too long. What Risk Factors Can Contribute to the Development of Mental Health Problems in Children and Young People? A recent article revealed how a 12-year-old girl, Jessica Scatterson, hanged herself after posting worrying things on her social media pages. In April 2017, Jessica’s friends contacted the police early hours in the morning after seeing a photograph that she had posted on social media in which she had written ‘R.I.P’ on her heel. When the police arrived at Jessica’s home, they spoke with her father, who then went to check on his daughter. Sadly, when he entered her room, he found she had hanged herself. The police later found notes and drawings in Jessica’s bedroom all relating to death. They also found nasty messages between Jessica and some of her ‘friends’ on her Ipad and in some of the notes that they found, she had spoken about being bullied, naming the people who had been causing her trouble. Jessica’s father struggled with his mental health and Jessica would help him by doing housework and looking after him in the best way that she could, some of her teachers say that she was taking on too much at such a young age. It was also revealed that teachers were aware of Jessica being called names and having arguments in school, but said they would not have called it bullying. There will be another post specifically about bullying coming in the near future. 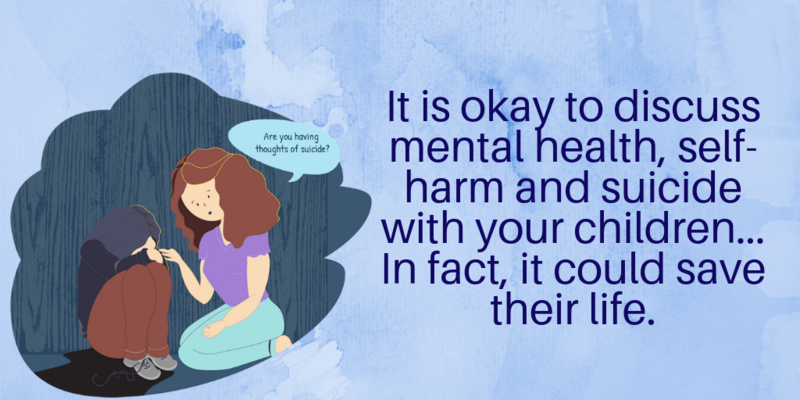 It is important to talk to your children about mental health and teach them the importance of opening up and being honest about their feelings as they are nothing to be ashamed of. It is important to teach your children to be kind and caring towards not only themselves but those around them as you never truly know what is going on in their lives. Show them that you care about them and that you are there to listen to them when they need someone to talk to. Show them the importance of self-care and getting out of the house instead of letting them stay indoors sitting on social media or playing on their games all day. Teach them how to love themselves, teach them self-worth and confidence and look out for any warning signs that might suggest that they are struggling. Mood swings – Yes it is common for all children to have mood swings at some point in their lives. But do not instantly disregard their behaviours as being ‘a phase’, ask them how they are feeling, ask them if there is anything that they want to talk about, or whether they are acting this way for a reason. Sometimes it might be more than them being ‘stroppy teens’. Becoming more withdrawn than usual. Sitting in their room, not communicating with you or their friends as much as they usually do, giving one-word answers and getting frustrated and irritated easily. This could be a sign of depression as well as other mental health conditions… it could also be a sign that they are experiencing something negative in their school environment such as bullying or generally struggling with their education and finding things difficult. Unexplained cuts and bruises. Most children come home from playing out with friends with new bruised or cuts… but are they becoming more frequent, are the explanations for these injuries becoming more vague and/or repetitive? Are they always in the same place on their body? They may be self-harming. It is important to keep an eye on them and check in on how they are feeling… if you are concerned that your child is causing harm to themselves, take them to see your doctor as soon as possible. If your child is becoming pre-occupied in regards to food, they may have an eating disorder. If they make excuses so that they do not have to eat, such as always saying they are full, not hungry or that they have eaten out, they may have an eating disorder. If they are losing weight dramatically, they are likely to have an eating disorder (or a physical illness). If they go to the bathroom straight after meals and is in there for quite some time, it could be a sign of bulimia. Having trouble concentrating, always seeming as though their mind is somewhere else. Dramatic behavioural changes – Maybe they start lashing out physically, being more aggressive, shouting, slamming doors and starting arguments frequently. Maybe they go from being lively and loud to being withdrawn and quiet. Physical symptoms – Headaches or stomach pains. Not wanting to go to school – Could be a sign of bullying, anxiety and/or depression. You know your child better than anyone else… any changes in them that concern you should always be addressed and should never just be put down to them going through phases. If you are concerned please take them to see a doctor or get in touch with mental health services to discuss the matter with them, the earlier a mental health condition is recognised, the better the chances for their recovery. DailyMail.co.uk – ‘Bullied’ girl, 12, hanged herself after posting late-night picture online showing ‘RIP’ written on her heel, inquest hears.